In my first blog post I explained that coral reefs provide us with some of the most complex and visually stunning ecosystems in the world. In environments as ecologically diverse as these, interesting symbiotic relationships are bound to occur. To recap, symbiotic relationships are categorized as mutualistic, commensal, or parasitic. My first post described how many mutualistic relationships on modern reefs are threatened by rising global surface temperatures and human activities that push reef abiotic conditions to the extreme. While my last post involved ways in which humans have impacted reefs, much of today’s post will focus on how the existence of commensalism on reefs has allowed us to expand our phylogenetic knowledge of reef dwellers. Commensalism on reefs is a relationship between two marine organisms from which one individual benefits while the other is not affected at all. Though seemingly straightforward, classifying commensal relations can be difficult, as new information can lead to the realization that a relationship is somehow impacting both of the organisms involved, thereby making it either mutualistic or parasitic. Because of these restrictions, this post will demonstrate the above information chiefly through one example: remoras. The most classic example of commensalism on reefs is the remora. Commonly called “suckerfish” or “sharksuckers”, these fish (of the family Echeneidae) attach themselves to the skin of larger marine animals like sharks and manta rays via a specialized organ on what we might consider their back. This organ, which acts as a sort of suction cup, allows the fish to travel with their host without damaging tissue, collecting food particles that the larger animal unwittingly distributes. This relationship is pictured below. Image 1: A reef manta ray (Manta alfredi) acts as host to many remoras; Credit: Esteban Toré. 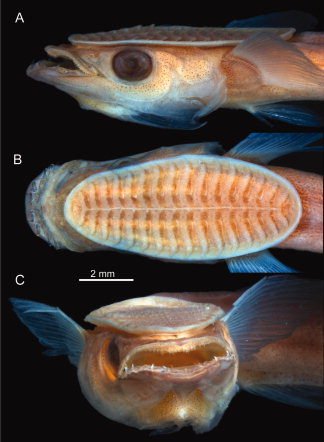 This strange adaptation of remoras remained mysterious until a recent study in which researchers with the Smithsonian Institution found that the suction cup-like organ was in fact the dorsal fin of the remora’s ancestors¹. In contrast with previous hypotheses claiming that the suction disc evolved independently as an entirely new structure, the new research suggests that it instead evolved through a long series of small changes to the typical dorsal fin found in other modern fish species². Image 2 gives a close-up view of a remora’s suction disc. Image 2: Head of a 26.7 mm Remora osteochir in lateral (A), dorsal (B), and frontal (C) view¹. 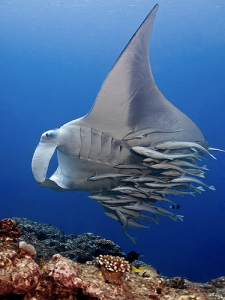 It has been suggested that because of the extra drag on the host while swimming, a remora’s presence could be harmful, technically making it a parasite. However, because its body composition evolved ideally for traveling with a host, the remora has a streamlined body that slows its host down minimally, if at all. 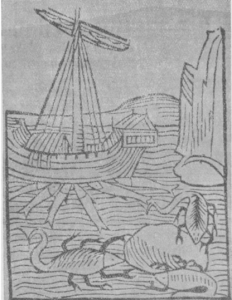 In the past, remoras attached to the hulls of ships were blamed for slowing down ocean voyages, and were even thought to be capable of stopping a ship in its tracks. Image 3 from the Hortus Sanitatis captures this idea. The Latin word remora means “delay”, so the fish derived its name from this false mythology³. Unlike fellow marine hitchhikers like barnacles, which can actually prove harmful to living hosts if biofouling (the accumulation of organisms on wet or underwater surfaces) reaches a critical point, remoras are simply commensal organisms, neither benefitting nor hindering their live or crafted hosts. 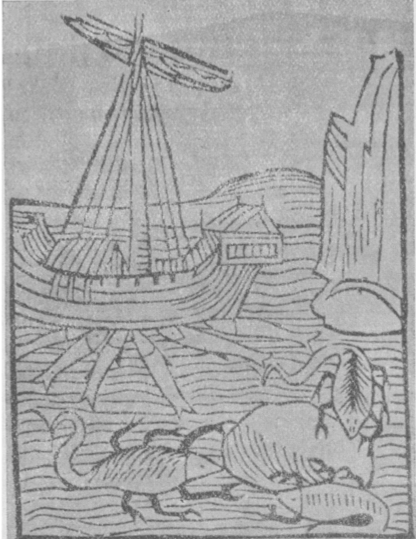 Image 3: Six “ship-holders” delay the passage of a ship. From the first Strassburg edition of the Hortus Sanitatis, 1497. Credit: E. W. Gudger³. 2 “Scientists Confirm Theory regarding the Origins of the Sucking Disc of Remoras.” Phys.org. Phys.org – News and Articles on Science and Technology, 6 June 2013. Web. 22 Mar. 2017. 3 Crew, Becky. “How the Sharksucker Got Its Suction Disc.” Editorial. Scientific American 4 Feb. 2013: n. pag. Scientific American Blog Network. 06 Aug. 2013. Web. 23 Mar. 2017. This entry was posted in Uncategorized and tagged 2017, Briley, commensalism, echeneidae, remora. Bookmark the permalink.